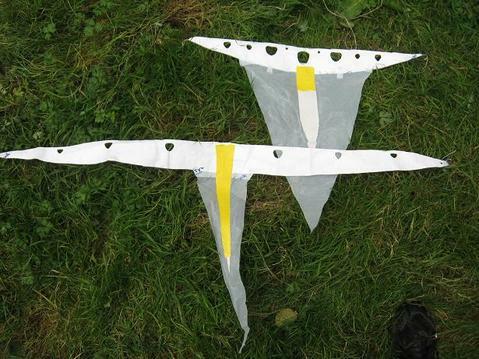 The attached JPG shows two recent KiteLab membrane wing-mills with pennant-like tails that enhance oscillation stability & widen the "tuning" range. One clearly sees how the flag-oscillation effect has been applied. Note the central band of tape to carry the oscillation wave smoothly downwind. No one has ever seen a flag fail to flap in a breeze, have they? The older wing-mills had the defect of glitching occasionally, sticking on a tack or "running rough," when tension or windspeed was suboptimal. The new design eliminates these problems. The new wingmills are a bit heavier, but pulse just as strongly, and remain arguably the highest weight-to-power of any AWE harvester element, with vast scaling potential. These who are unfamiliar with these devices can review extensive postings early on this forum. -larger wing-mill in high-wind aggressively driving a spragged generator.